5 November 2016 – Dig Delve – An online magazine about gardens, landscape, growing & making. I try hard to ensure that these posies picked from the garden are done in real time, but last weekend I flew off to the States for a week’s work. So this bunch I picked last Saturday before the frost, which till then had kept itself to the hollows down by the stream, made its way up into the garden for the first time on Sunday morning. These are the very last of the dahlias, pushing against the tide of decay, but dwindling daily with the increasing cold at night. Blackened the instant the frost arrives and heralding the coming of winter. Usually this is the time to lift dahlias. The tender foliage is seared back to the stem. Dig down and the fleshy tubers are rude with a summer’s feeding and full of the energy they need to sustain them through the winter. The two species I have selected here have so far proven themselves to be just as happy in the ground with a little help in the form of a mulch of compost to keep them through the cold season. 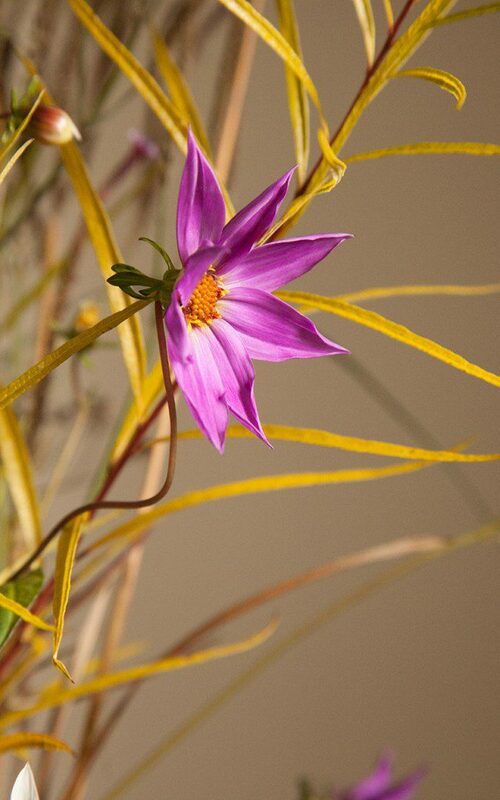 Despite the elegance of its finely divided leaves and sharply drawn flowers, Dahlia australis is a plant that needs room at the root in company. Try to lift the tuber and you find that it is easily a two-man job and this is why the push of growth is strong and constant from the moment it comes through in the spring. Standing now at shoulder height and a stretch of the arms across this is not, however, a plant that feels demanding of space. 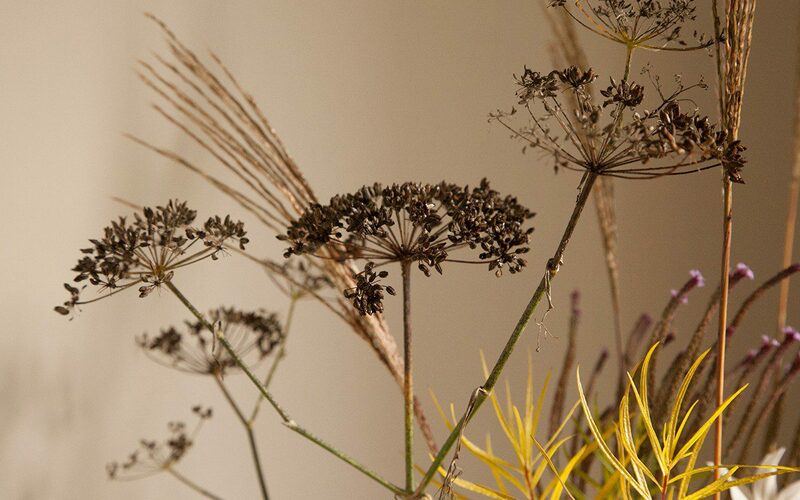 With delicate growth and single flowers on wiry stems, there is a lightness about it that tends to be lost in the hybrids. For this reason I have decided to keep it in the garden as it will sit well with the wild feel of its companions. I plan to have it amongst Verbena macdougalii ‘Lavender Spires’, which you can see here at the very end of its flowering season. The tiny violet flowers, which leave behind them a sterile taper, have been flowering for months, but now have nowhere left to go. Three or four plants spread widely in a bed provide a vertical accent and the dahlia will be good pushing its way through this floral cage. Dahlia merckii ‘Alba’ is of an altogether lighter weight and more delicate disposition. Standing at no more than chest height, with delicate growth and foliage, this is a delectable dahlia. Despite its appearance, it seems to be perfectly hardy, and I would not want to be without it for its constancy of flower. These are pure white, small and widely-spaced and dance like butterflies in wind, but if the plant is not in good company it will snap and break. Teaming it with low perennials that will not overwhelm its foliage is better than staking. Far less fiddly and better for the dahlia to find its own way, since the spaciousness in the plant comes out in several directions from the crown. In the stock beds I have it with a herbaceous Salvia pratensis, but when I use it in the new garden I will team it with the Amsonia hubrichtii that you see colouring gold in this posy. 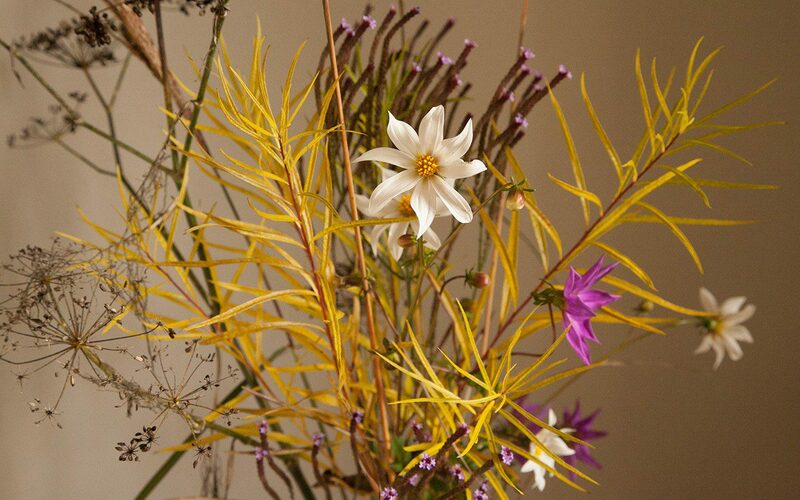 They are both sun loving and, after its early flower, the amsonia will leave room for the dahlia to get away in the first half of the growing season. 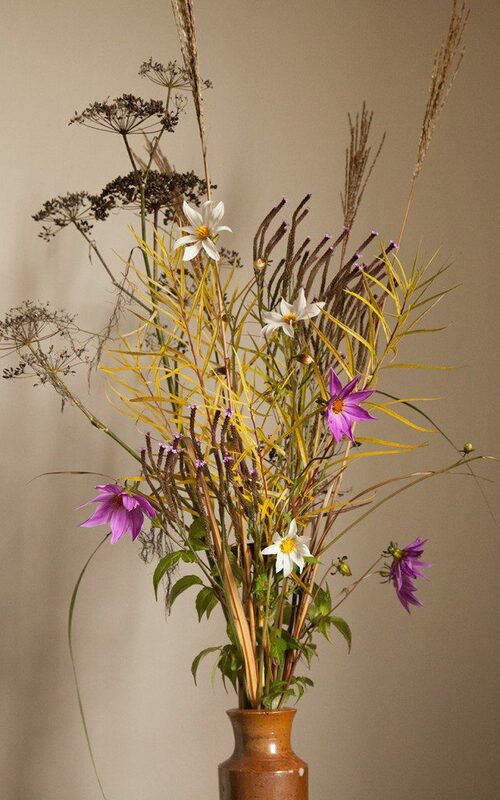 The flowers of both these dahlia species die well by simply dropping their petals and, as they seem happy to continue to produce without throwing all their energy into seed, there is no need to dead head as you might their more flamboyant relatives. The singles also have the added benefit of being accessible to pollinating insects. 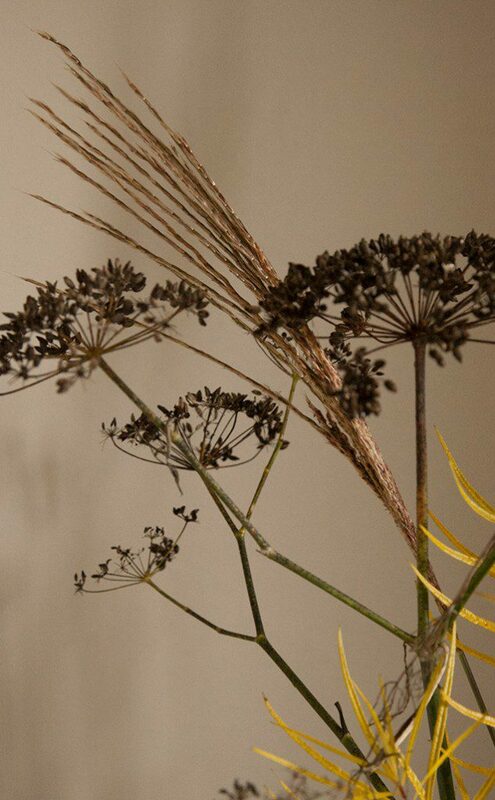 I have included the bronze fennel in the bunch for its darkness now that it is in seed and the miscanthus for its ability to harness the light in its inflorescence. I am finding the miscanthus difficult to place in the garden because they have such a strong atmosphere which smacks too much of somewhere else to sit easily in this landscape. I have seen them growing wild in Japan, where their plumage is the emblem of the autumn season and their clumps illuminate autumnal verges. Miscanthus sinensis ‘Dronning Ingrid’ is a new variety to me with foliage that colours with flashes of red and orange at the end of the season. The flowers, which are not as dark as some but emerge with a red flush nonetheless, soon pale to silvery bronze. 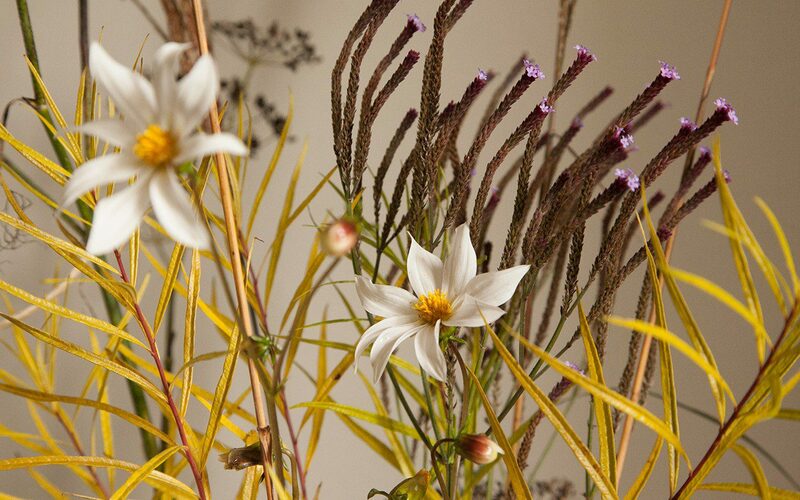 The flower, held free to catch the breeze, is more tapering than many miscanthus but, come the winter, it lives up to its common name of Silver Grass as it flares in the low light.